Pleased to meet you this week! Thank you to all the parents who came to speak to class teachers at parent consultations. The staff always enjoy sharing the children’s targets and successes. The two way flow of information is a really positive way for us to work in partnership to maximise children’s progress and to hear about pupil insights into what we do. Any parents who would like more information about both Y2 and Y6 statutory testing, can access parent information from the Department for Education (DfE). We have more parent consultations as part of our structured conversations next week. Please ask your child’s class teacher if you have not yet received a time slot. Throughout the week myself and senior leaders have been spending more time in classrooms enjoying the activities and learning experiences. There has, as always, been a wealth of exciting opportunities and experiences on offer. Year 5 and 6 welcomed an artist to support drawing techniques using the Greek theme with some very special results. And in Forest School children have started to work on a new theme for badges – for example with Y1 and Y2 working on their animal welfare badges. Check out the facebook pages for ideas on how families can do things to support children with their badge work if they are out and about. Year 3 enjoyed a Hula Hoop festival and created some great shadow puppets this week as part of their focus and in Early Years they have been working hard to promote their Bake Sale (This Friday at 2pm from the community room!) raising funds for the outdoor areas. The energy and excitement that permeates every classroom is tangible throughout the day. 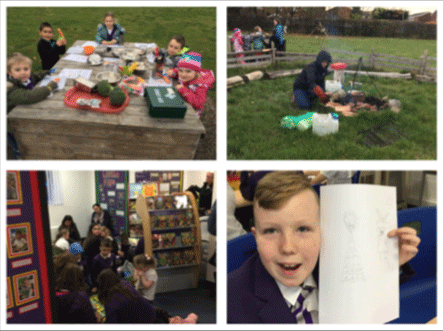 Our children thrive on the raft of experiences and I am extremely proud of pupil achievements with some examples of exceptional progress, which are both a result of the hard working staff team who strive to meet pupil needs on a daily basis. Calling all parents! Have you ever wondered what role governors have in school? Have you got questions you would like answered about their role? We are updating the governor section of the school website and are keen to have a ‘frequently asked questions’ (FAQ) page. Please send any questions that you would like to ask about governors and their role at CVPS to info@villageprimary.org. It’s certainly been a term of inspections! Congratulations to Chef Lynn and her hardworking team who have scored top marks in their kitchen inspection which took place recently. Well done to Y3 for doing so well in last Friday’s Hula Hoop festival! Staff were amazed and delighted with the great achievements shown by our children. We are delighted to welcome Louise Tweddell back to CVPS in Y4 to support the class during Lucy’s absence. Louise started back with us this week after a highly successful period covering in Y4 last year. The leaves on the ground at this time of year can be picturesque. This week it would be lovely to go on your very own autumnal photo shoot where you can take photographs of a teddy/family member or friend in the outdoors doing various different things. Please post them on the class Facebook page for us all to see. Our leaders have finalised the school development plan that we intend to publish on the school website this term, once approved by the governors at their meeting on the 27th November. 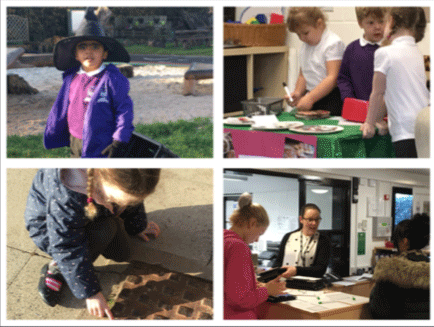 Our key priorities, include improving our library provision; sustaining strong progress throughout school; strengthening reading across school; developing EYFS outdoor areas; embedding the maths mastery approach implemented last year; and sustaining strength in behaviour and pupil well being. 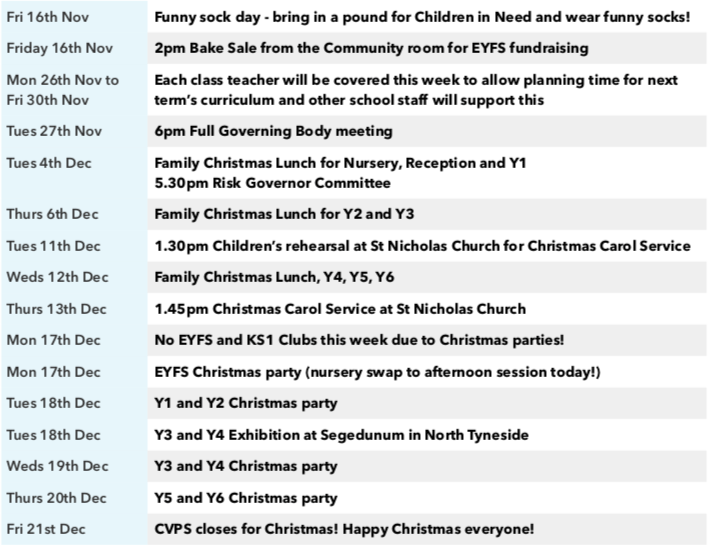 We will email out a copy to you with the weekly newsletter. We are delighted to welcome two new babies to the CVPS family this past week. You can see how proud both Zack and Erin are of their new baby siblings. Y6 win extra playtime this week for best attendance and punctuality!